1. 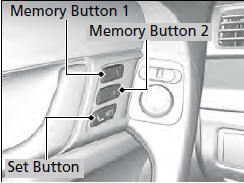 Adjust the driver’s seat to the desired position, and turn the ignition switch to ON . -You will hear the beeper, and the memory button indicator light will blink. - Once the seat position has been memorized, the indicator light on the button you pressed stays on. • You turn the ignition switch to any position except ON .